With SAS you can easily manage your devices and options such as Location Services, Bluetooth, Wi-Fi, USB, Camera, as well as enable or disable Secure Group applications, upgrade or downgrade Secure OS versions and many more. There are several improvements and bug fixes added to the Secure Administration System v 2.3.0. We have addressed the issue when the group administrator could see the accounts belonging to a different visibility group within the Consistency Validation widget. This behavior was not only causing inconvenience for some of our users, but also posed a security threat that had to be resolved with the highest priority. We have also fixed an issue when resetting the device's data usage limit. Previously, when you reached your device's data usage limit and wanted to reset it from SAS, the device still reflected the old amount of data used. With the latest version of SAS, when you reset the data usage limit, this is now accurately reflected on the device after the sync. 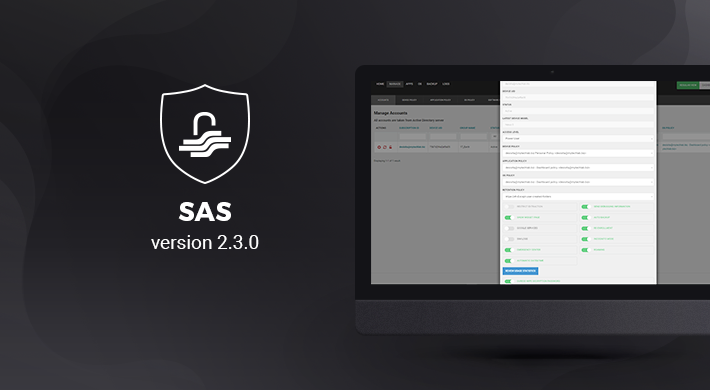 There are also many minor bug fixes, improvements to UI environment, as well as back-end optimization to ensure smooth communication between the SAS platform and Secure Phone devices.